When it comes to pop culture, I’m a dunce. Yesterday, for example, I had to Google Lindsay Lohan and Megan Fox (don’t ask). If either of them were seated next to me at a restaurant, I’m sure I wouldn’t recognize them. Even if I did, I’m not sure I would care. And so, it was perhaps not surprising that I obliviously sat down next to movie star at a tiny little cheese shop near Marylebone High Street in London. 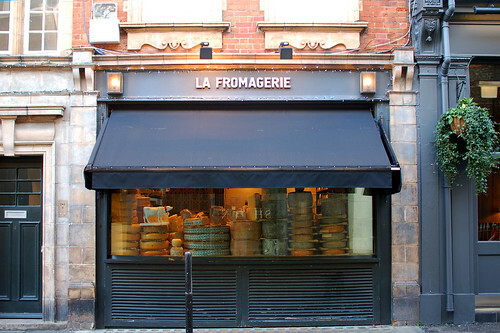 Many of the top restaurants in the city get their cheeses from ﻿la Fromagerie. I saw the shop’s name on quite a few menus about town. It’s not large, la Fromagerie. Aclutter with specialty foods, kitchen nick-knacks, and edible esoterica, the place crowds, especially during the holiday season. I was there just a week before Christmas in 2008. There’s a climate-controlled cheese room, into which the cheesemonger allows only a few to enter at a time. Really, a few is all you can fit in that tiny little closet anyway. It’s stacked with cheeses of all colors, sizes, and nationalities in orderly chaos. It’s one of the more amazing corners of our world. They serve food too: some hot, much of it cold, and, of course, you can always order their cheeses. A tourist with no refrigerator, I came to spectate and eat. There’s a long, communal table with bench seating at the back of the store, orbited by a few floating deuces. Counter seating lines the back wall. When I arrived around noon, the small tables were already claimed by ladies who lunch; the counter was crowded with suits on stools catching a bite to eat. I plopped down on an open stretch of bench at the communal table and immediately launched into an email exchange on my mobile with a friend, who was trying to rig his office schedule to meet me for lunch. A young lady came by to give me a menu. I told her that a friend might be meeting me shortly; I’d wait a bit to order. I suppose it was my American accent that made the gentleman to my left look up and notice me. And that’s when I noticed him. A young guy, he looked very familiar. I couldn’t quite place him. When his friend arrived, a young Irish fellow, equally good-looking, I became certain that he was an American. It’s so hard not to listen to ambient conversation when you’re literally elbow-on-elbow with the stranger next to you. And then it suddenly dawned on me. He was an actor. In fact, I had just seen him in a movie. In fact, I had seen him in quite a few movies. I got back on my mobile and discreetly emailed my pop culture experts abroad. The answer came back quickly. Well, waiting for my friend was a lost cause. He was detained at work. So I ordered, and promptly removed myself from the table to an opening at the counter, letting two elderly ladies to take my spot. I had a very small salad of mixed greens, the price of which was magnified beyond reason by the ridiculous exchange rate. And with it, a lovely pigeon terrine served with two golden slices of toast and some pickled vegetables. Gosh, I wish I had room for cheese. On my way out, my young waitress pulled me aside and asked me why I gave up my seat next to the actor. I told her that my friend couldn’t make it to lunch and I felt unreasonably greedy taking up precious real estate at the communal table. For the twenty-third photo of the week, I give you a snapshot of la Fromagerie that I took from the street. * A hint: The actor was in London for a stage production of “The Rain Man,” which also starred the Irish fellow who sat opposite him at la Fromagerie that day. ~ by ulterior epicure on November 28, 2010.